Best Offer Market Place is where you can make offers on investment and museum quality natural history items. This new sales forum will rival any of the top auction houses in quality, variety and... there is NO BUYERS PREMIUM! That is an instant 20% savings so buyers get more for their investment!! To participate, select the "Offer" button and make your best offer. All offers will be considered! Unlike typical auction houses, items presented here do not have a time limit so we may accept your offer immediately, make a counter offer if we are unable to accept your offer or we may wait until more offers come in. Either way, replies are typically sent within 24 hours after receiving offers. NWA 8673 is a Lunar Feldspathic Fragmental Breccia meteorite found along the Moroccan border in 2014. The interior exhibits dispersed, small beige clasts and specks of metal. 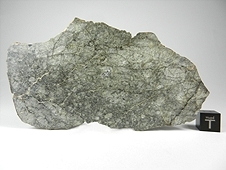 This lunaite is composed of mineral clasts of anorthite, pigeonite, augite and olivine with accessory troilite and kamacite, plus sparse mare basalt clasts, in a finer matrix. It consists of one 263 gram dark gray stone. 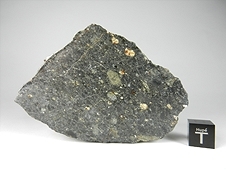 NWA 4468 is a Primitive Enriched Olivine Basaltic Shergottite Martian meteorite. A single 675 gram, wonderfully fresh and mostly crusted stone was purchased in Western Sahara in July 2006. 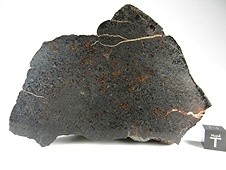 It represents one of the freshest Martian meteorites discovered to date, nearly as fresh as observed falls. This remarkable meteorite has large amounts of maskelynite (shock glass), which is a wonder to observe under a microscope! NWA 4468 is by far one of the most beautiful Martian meteorites known and would make for a worthy specimen in any serious collection. Hupé, G.M., (2006) Dynamic Duo - Spirit Lives and Opportunity Knocks! (article).. "Incredible!" In a word, this is how I would describe NWA 7007. With its lighter gabbro lithology dominating the darker basaltic matrix, this lunar meteorite in very striking to behold. Beyond the abilities of the human eye to see are trapped microscopic solar wind bubbles in glassy vesicles. 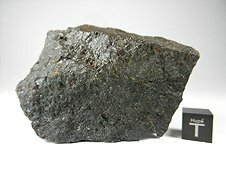 Hupé, G.M., (2006) Million Dollar Meteorites of 2005 (article). The 1122 gram main mass is curated at the Royal Ontario Museum in Canada. Most of the specimens I have available are listed here. As you can see, there is not much left to go around! 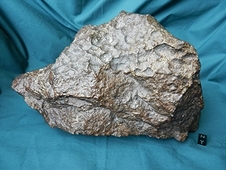 NWA 4587, an Ungrouped Achondrite purchased in Morocco in June 2006. This unusual meteorite is paired to NWA 011, which was first thought to be an unusual eucrite or even from the planet Mercury! Scientific analysis performed since then (including multiple measurements of oxygen isotopes) suggests that NWA 011 and its pairings probably are rare samples from a different and somewhat large parent body other than 4 Vesta, which also may be the source of CR chondrites. The officially classified pairings include; NWA 011(40g), NWA 2400(137g), NWA 2976(219g) and NWA 7129(50g). NWA 4587 is the largest of all the pairings at 530 grams, making the total combined weight 976 grams. NWA 4587 has been priced well below the previous retail price of $1,000.00 per gram, which NWA 2976 has sold out at! Every slice of NWA 4587 has been lightly polished on one side to bring out the beauty of this rare and unusual meteorite. This is a must-have for any serious collection! 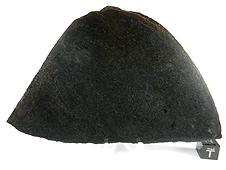 Every now and then a larger well preserved meteorite is found in the Sahara desert. This 10.179 kilogram example is no exception! It is 100% intact and displays two sides of regmaglypts and two other sides where the stone actually sheared off at 90 degree angles making for a striking collection piece! While a good portion of the original fusion crust has long ago worn away by years of sand abrasion in the desert, much of the crust is abundant on the two flat surfaces as can be seen in the images. This large chocolate-brown chondrite meteorite would make a fine addition to any collection! 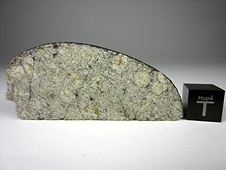 NWA 4931 is a single 2140 gram stone paired to NWA 2999, one of the most interesting Angrites ever found. It was brought back from a Moroccan expedition in August of 2004. 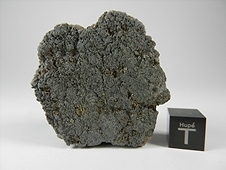 This meteorite was not recognized as being anything exceptional until April of 2005, when Greg Hupé found time to investigate the entire haul from this trip. After examining hundreds of suspected meteorites he found 12 complete stones totaling 392 grams that looked somewhat different from the rest. Nobody would have guessed these stones would turn out to be ultra-rare Angrites, because texturally they look completely different from what most would expect. A sample was liberated from one of the stones and sent to Northern Arizona University and a second sample from a different stone was sent to the University of Washington. Both laboratories found that the mineral compositions matched those of Angrites. A decision was made to sample and test each of the 12 stones because the potential for additional important findings is great. NWA 2999 is unique in having unusual mineral compositions that mimic terrestrial processes leaving some scientists to believe these types of stones could have only formed on a planet-sized body. 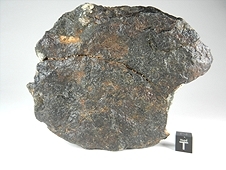 Unlike most of the other known Angrites, NWA 2999 was found to be a plutonic rock, meaning that it formed underground and was not extruded in a lava flow. Interestingly enough, this sample lacks vesicles. The magnitude of these findings prompted scientists to send off a specimen to the Carnegie Institution in Washington D.C. for oxygen isotope testing. The results confirmed that NWA 2999 is the 10th member of the unusual and scarce Angrite group. "NWA 2999 is unique in many ways from other Angrites including LEW86010. I think we can make a valuable contribution to the understanding of Angrite origin/parent body characteristics!" 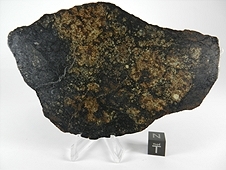 "This meteorite is unique among known Angrites. It is texturally very different from most Angrites in having a plutonic rather than volcanic or quench texture, and it lacks vesicles!" NWA 2999 is featured in the November 2008 issue of "Astronomy" Magazine, along with angrites, NWA 4801 and NWA 4590 "Tamassint." 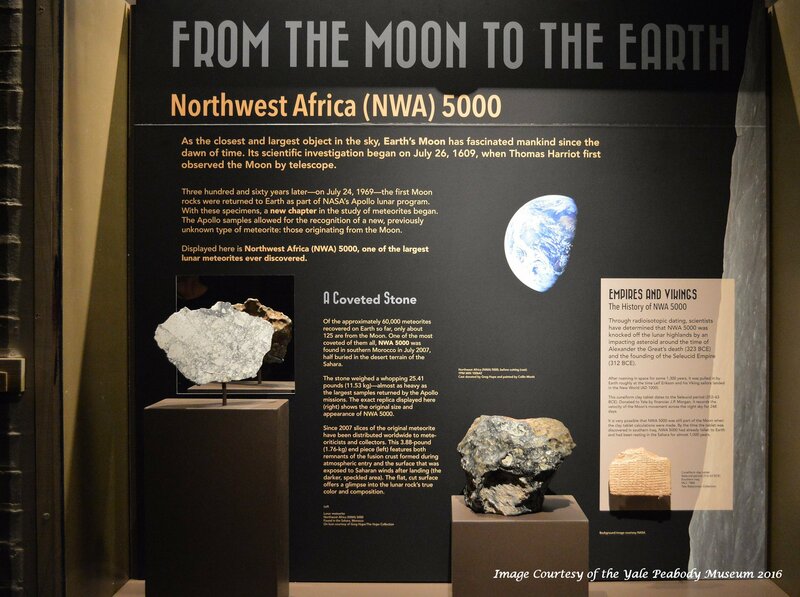 Northwest Africa 5000 is one of the largest lunar meteorites ever found. 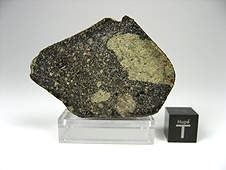 It is exceedingly important in that it represents a previously unexplored part of the Moon and is the only Highlands Gabbro available for study. Originally, it weighed 25 lbs 6.6 oz. (11,528 grams.) Although the weight is tremendous, the internal structure and visual appearance of NWA 5000 is unlike any other lunar meteorite and is considered the Best-of-the-Best! The contrast is incredible. The matrix looks like a moment caught in time as the impacting asteroid shattered solid rock on the surface of the Moon before ejecting NWA 5000 into space. 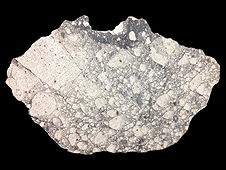 This meteorite contains breccias within breccias, and the preferential orientation of clasts lends a unique 3-D appearance. Included in the stone are an unusually large amount of 4.5 billion year old impactor metal (nickel-iron). The exterior appearance is outstanding with well-preserved regmaglypts ("thumb-printing" marks from atmospheric entry), areas devoid of fusion crust that have been naturally polished by the Saharan 'Winds of Time' and generous amount of well preserved fusion crust. Northwest Africa 5000 has become legendary in the short period of time since its discovery in Morocco in 2007. Never before have slices been cut and polished to just 1mm, this means the 'Surface-to-Weight' ratio is tremendous and offers the maximum viewing surface! 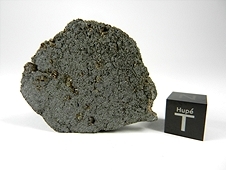 Many have asked, "What lunar meteorite could possibly be better than NWA 5000?"... Simple, ultra-thin polished slices of NWA 5000 offered exclusively on Nature's Vault! I have absorbed the cutting/polishing losses and expenses to present the very best this lunaite has to offer. NWA 7319 is a stunning L5 Melt Breccia chondrite with a shock stage of 6 and weathering grade of 1. The Total Known Weight is 6414 grams in a single stone purchased in Morocco in April 2012. It displays gorgeous melt "rivers" enveloping "islands" of matrix with a nice amount of large and small vesicles, all covered with smallish metal flakes. The large slices offer a very generous size-to-weight ratio meaning that you get more display surface to the weight investment! The fresh interior shows dispersed clasts of chondrule-bearing material within more abundant fine-grained, black material containing ellipsoidal metal+sulfide grains. Some regions contain sparse chondrules with moderate amounts of metal, but the predominant lithology is composed of very fine grained olivine, pyroxene and rounded grains of intergrown kamacite+troilite. 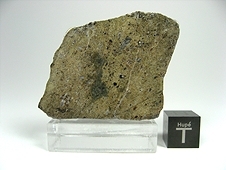 The geochemistry consists of: Olivine (Fa23.7-23.8), orthopyroxene (Fs19.7-20.6Wo2.8-1.9). The majority of NWA 7319 is made up of the 4120 gram main mass which is curated in a private collection. I have listed all that is available here! NWA 6706 is a gorgeous L6 Melt Breccia that has a very low Weathering Grade of 'Zero'! There are only 10 of these types in the Meteoritical Bulletin making for a rare type that is also very desirable to collectors. I had this stable meteorite cut on a wire saw so the large slices could be made as thin as possble to offer collectors as much displable surface area as possible! It took a high polish which emphasizes the crushed and melted features of this breccia. NWA 6566 is a very stunning shock melt Eucrite. It has a high Shock Level of 2-4 and a low Weathering Grade. The matrix displays the fine-grained granular to subophitic basalt with basaltic xenoliths and rare diogenite and glassy shock melt clasts arranged in flow orientation. It also has a large melt pocket in the middle of the stone. These are the last two specimens available! 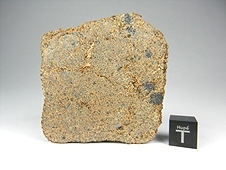 NWA 4882 is a rare Brachinite meteorite found in Northwest Africa during the summer of 2007. Weighing in at 3097 grams, it represents the largest Brachinite yet discovered, making for world-class specimens! The size of the surface area is important to scientists and collectors alike in that it helps to provide vital data on the makeup of these extremely rare meteorites, and also results in stunning visual appeal. Every specimen has been expertly cut to a 2-3mm thickness and polished on one side to a very high level, making for beautiful display and study examples. Brachinites are considered by some researchers to originate from a current or former planet! 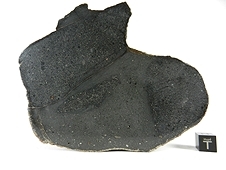 Scientists are very excited about these specimens because they exhibit unique textural characteristics not previously found in any other known meteorites! The material must have been heated to a point where it became "plasticized" and mixed, presumably in the deep interior (mantle) of the NWA 5480 parent body (presumably Vesta-related). 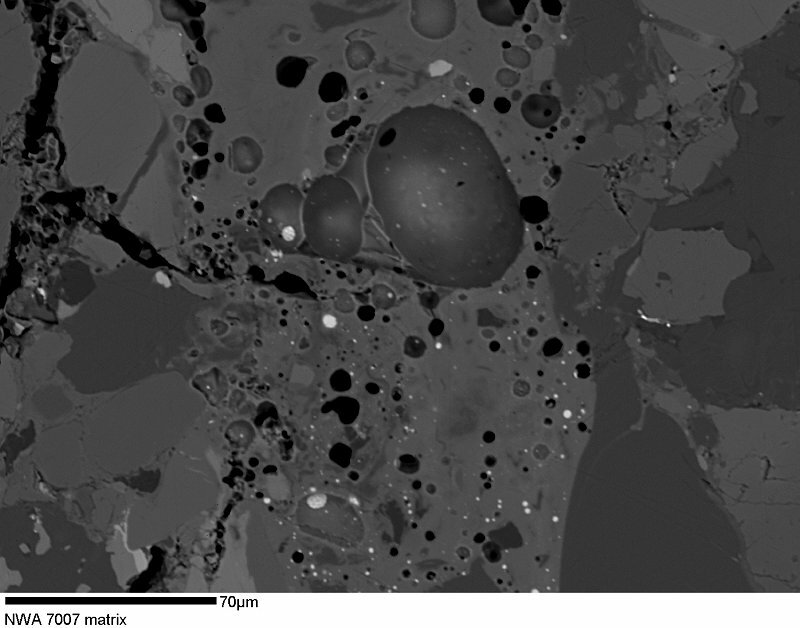 By analogy with deformed olivine-orthopyroxene-rich samples of the Earth's mantle (known as harzburgites), it appears likely that temperatures were high enough that NWA 5480 represents a solid residue after partial melting to produce molten magma, which presumably ascended towards the surface of the parent body. 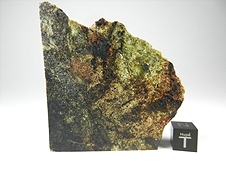 The "swirl" texture that can be seen on the interior and exterior graphically displays the flowing and mixing of the olivine and orthopyroxene grains, with intermingled chromite crystals. Martian Nakhlites are among the most interesting meteorites that exist. They are extremely complex and contain carbonites, the building-blocks of life as we know it. The Mars rover, Curiosity, landed on the Red Planet on August 5, 2012, kicking off a two-year mission to determine if Mars has ever been capable of supporting microbial life. Perhaps that Earthly vehicle will be the first 'person' to find signs of life on such a desolate planet! The NWA 6148 main mass is curated in a private collection and I received the balance of the material. I have listed here virtually all specimens other than a few grams of fragments created during the cutting and polishing phase. NWA 6148 is friable so special care had to be used during this process. Dhofar 1575 is a fresh Ureilite that has a low Weathering Grade. A single 2800 gram individual stone was found in Oman in April 2009. Acanthite (Silver Sulfide) Ag2S Imiter Mine, Morocco Acanthite crystallizes in the monoclinic system and is the stable form of silver sulfide below 173 °C. It is the only stable form in normal air temperature. It is about 65% pure silver. 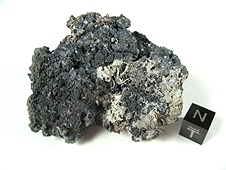 Acanthite is a common silver mineral in moderately low-temperature hydrothermal veins and in zones of supergene enrichment. It occurs in association with native silver, pyrargyrite, proustite, polybasite, stephanite, aguilarite, galena, chalcopyrite, sphalerite, calcite and quartz.